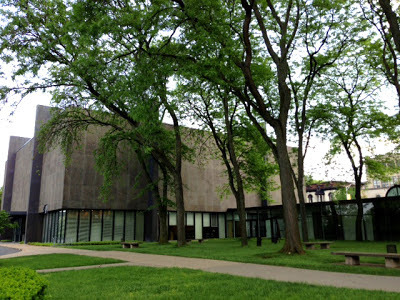 Two weeks ago when I was in central and western New York State I drove east to Utica to visit a museum that had a big impact on me way back in 1967 when I was very early on in my art student days, the Munson Williams Proctor Arts Institute. 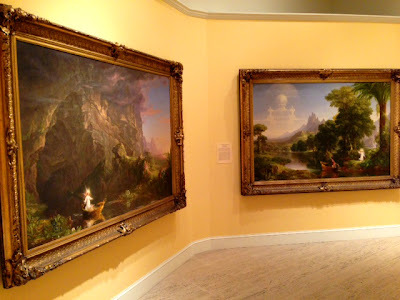 It was the first time I'd really noticed American landscape painting and I credit MWPAI for planting a big seed in me that would sprout only a few years later. Mary Murray, the Curator of Modern and Contemporary Art, was kind enough to take a break from hanging their new Andy Warhol print show and spend time with me talking about the museum and her time working there. She was engaging and obviously loves the museum. 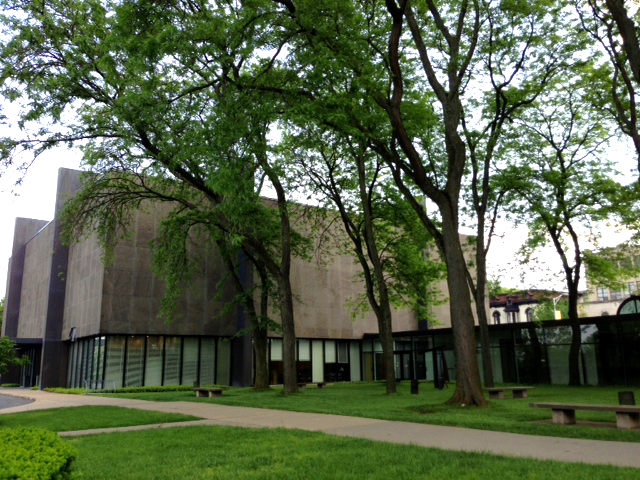 As I said the museum is hosting a big Warhol exhibition this summer (through Sept. 8). Warhol is an interesting figure. His celebrity rose to such a point that he was given walk on parts in Hollywood comedies, something unheard of for a visual artist. A real problem museums and galleries face in presenting contemporary art is much of the public feels unconnected to the work. Whether it's good or bad, a lot of people fear they don't know enough about contemporary art. Nobody wants to look ignorant, so instinctively they stay away. It's understandable. I think the fact that many have heard of Warhol makes them more willing to come in and check out the exhibit. And stick around to see what else the museum has hanging. Probably a lot of new feet that have never before entered the museum will come through their doors. 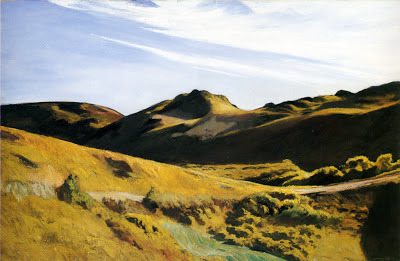 One of the crowning glories of MWPAI's Collection is Edward Hopper's The Camel's Hump, an oil from 1930 that Hopper painted from what would become his driveway to his studio in S. Truro on Cape Cod. The landmark "hump" in the painting sadly was destroyed years later by an over eager builder who bulldozed the thing to make way for a house he wanted to build, which strikes me as idiotic. Ironically he had failed to secure building permits and construction of the offending house never happened. To this day you can see the hole in the ground where the pyramid-shaped dune that attracted Hopper's eye once stood. When I first went to stay in Hopper's studio in the fall of '83 I did an oil from exactly the same spot Hopper stood on to do his painting, but without the central feature, the scene feels empty. 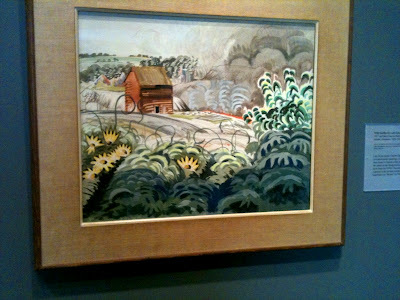 Standing in the MWPAI looking at Hopper's magnificent oil I found myself toying with the idea of going back to my painting and inserting the old hump. Maybe I will. Here's a terrific George Luks (American 1867-1933) Roundhouse at High Bridge from 1909-10. Sadly my photo doesn't do the painting justice. 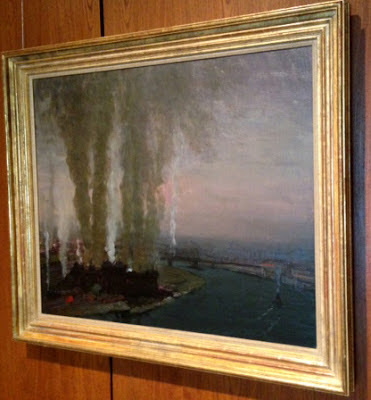 There's an elegant range of colors to the rising columns of smoke and a daring asymmetry to the canvas. Below is another of the paintings I find amazing Sunset from 1856 by Frederic Church (American, 1826-1900). I think this is one of Church's very strongest paintings. Look at the skillful counterbalancing in the sky. He wants an authentic brilliance to the light, not some cheesy effect, so he makes the gold sky on the horizon strong but not as intense as it could be. Church turns the volume way down on the cool violet pink grays in the other clouds and makes most of the sky an almost neutral bluish gray. Also there is an admirable range of edge qualities to his clouds, from distinct in the low hanging oranges to filmy and in the upper reaches. When it came to artful paint handling, nobody could touch Church. 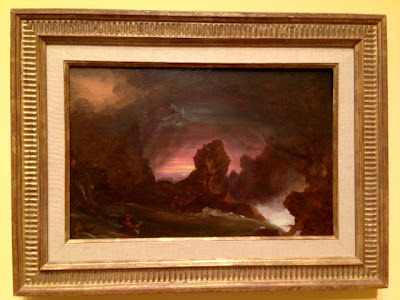 Church's teacher was Thomas Cole (1801-1848) who lived just a bit farther east from MWPAI in the town of Catskill, NY. 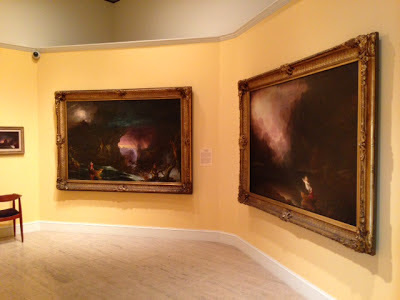 It was there that Cole painted one of the most impressive holdings in MWPAI's Collection, the monumental four panel series The Voyage of Life from1839-40. (A second version of the series painted later is now in the National Gallery of Art in Washington, DC). Cole's a fascinating guy- his wholehearted embrace of nature wins you over. In particular, he had a gift for carving out deep spaces and filling them with luscious light-filled atmosphere. In a way he's the anti-Warhol, painting his vistas without a touch of the tongue-in-cheek irony you see in pop art. I find Cole's sincerity is quite moving. flowing out of the mountainside cave. I want to hop in the boat with him. Followed by Manhood (L), and Old Age (R). The museum also owns an oil study Cole made in preparation for his Manhood panel. I love the cool highlight in the churning water in the foreground played off against the warm yellow highlights in the sky. 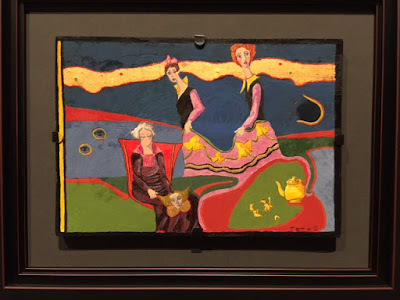 One of the things that's fun about visiting a new museum is your eye doesn't quite know what to expect and can be caught by artists you rarely see. I spied this oil from a distance and immediately liked the sharp, truncated forms all crowding around each other. 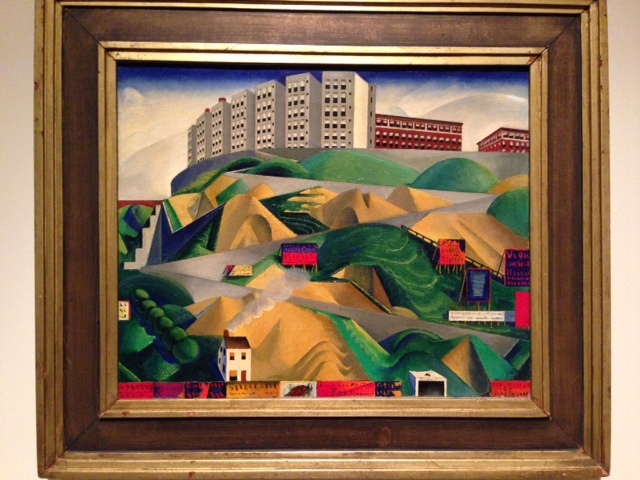 It's by Preston Dickinson (1891-1935), an early American modernist. Dickinson studied at my old Alma Mater, The Art Students League of New York. It's Fort George Hill from 1915. A composition like this could have just been a jumble, but Dickinson clusters together his separated forms into groups of similar tone and color to provide an overriding simplicity for the eye. Also like the Cole study above, he beautifully plays warm and cool off against each other in his highlights. One other thing I loved at the museum was the brightly painted room where they have art supplies all laid out for kids (or maybe anyone else) to try their hand. 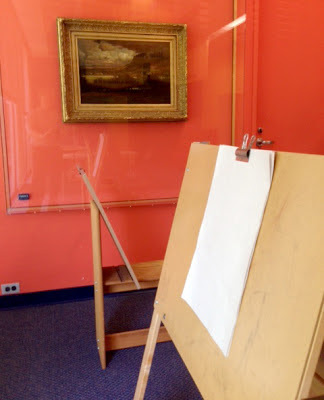 Topping that off, you get to set up and work right next to a beautiful oil by one of the great masters of American landscape, George Inness (1825-1894). I am sure old George is looking down approvingly from art heaven. MWPAI lies just south of the Barge Canal, the successor to the historic Erie Canal that connected the Hudson River and New York City with Buffalo and the Great Lakes. In its day it was a technological and engineering marvel and it retains an unassuming sort of beauty. When I was very little we lived in Fairport, NY just a couple of blocks from the canal. I still recall the thrill to my 3 year old eyes of seeing the lift bridge on the town's main street raise up to let boat traffic pass through. I made a point of stopping at several points on my trip to check out my old friend the Canal. Here's one of the results I did early one morning, Barge Canal, vine charcoal, 12 x 9", 2013. 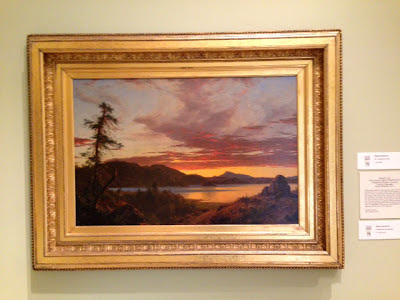 A fellow painter, Jim Condron, suggested that I check out your work and blog. 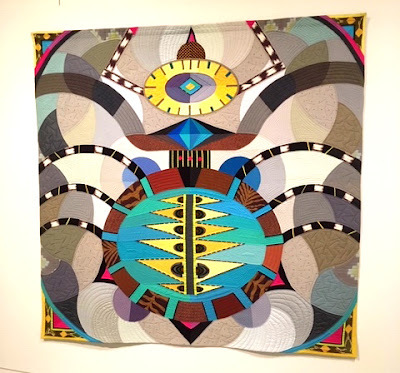 I like your work, specifically your color sense and use of light and depth. Your paintings feel to be about the 'essence' of a place rather a very specific spot. That switch from essence to specificity can happen when I paint from a photo - which occurs by necessity in the winter and other times. 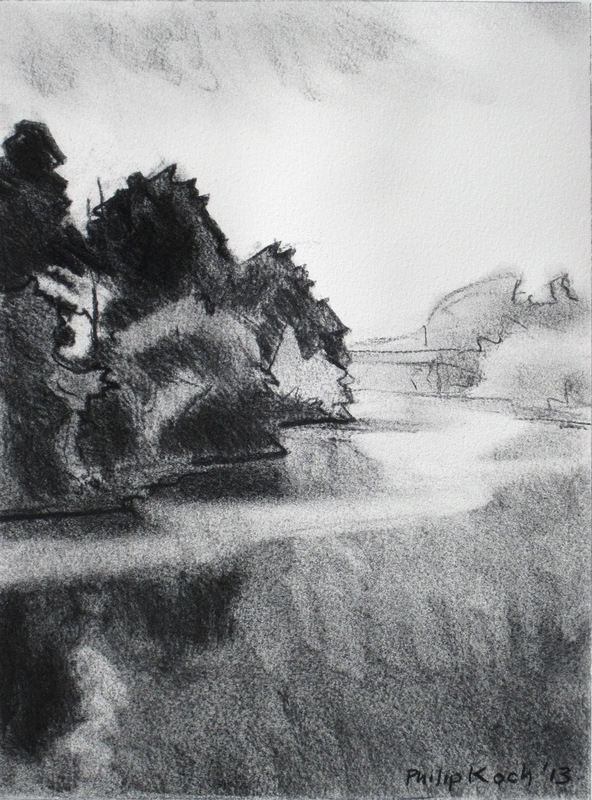 The immediacy of plein air work gets to the essence, I think.